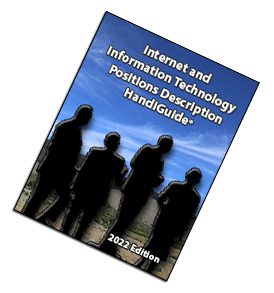 The Internet and IT Position Descriptions HandiGuide™ is over 800 pages; which includes sample organization charts, a job progression matrix, and 300 Internet and IT job descriptions. The book also addresses Fair Labor Standards, the ADA, and is in a new easier to read format. To see the what has changed go to our version history. The IT Job description positions include all of the functions within the IT group. 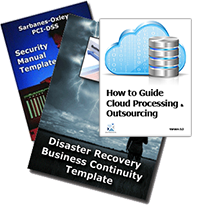 The Job Descriptions have been updated to be compliant with Sarbanes-Oxley and the ITIL standard. The job descriptions are all structured to focus on "Best Practices" as defined by the IT Productivity Center to meet the requirements of World Class Enterprises. They are ready to use and easily modified to meet your enterprise's unique requirements. You can purchase this book as a PDF Book, Word Book or as individual word files for each Job Description (in and Word .docx format) which makes for easier modification. We have also combined the both book formats with the individual word files for each job descriptions to give you the best of both worlds.